It’s no secret that I’m a dedicated dog mom. When I’m not here in the office, you can usually find me at the dog park or on the trails with my canine companions. This summer, I brought home my second dog, an eight-week-old Australian Cattle Dog puppy. My senior Australian Shepherd was less than thrilled with our new blender with legs. Helping them bond and form a close friendship was no small feat, but with a lot of planning and patience, they’ve finally hit their stride as a dynamic duo. Just like people, dogs are individuals who have their own personalities. When going through an adjustment period (like bringing a new puppy home), remember to be patient, and be open to trying new training techniques. Techniques that work for some might not work for you and your dog. You know your dog and his needs better than anyone. There’s no one-size-fits-all guide to introducing dogs and helping them bond. Just keep at it, and when you find something that works for you, stick with it! Ready to bring home your new puppy? This handy guide can help make the transition easier on you and your older dogs. Your older dog WILL be jealous of the puppy. Puppies require an extraordinary amount of time and attention- attention that your older dog is used to soaking up all by himself. Fortunately, puppies sleep a lot. 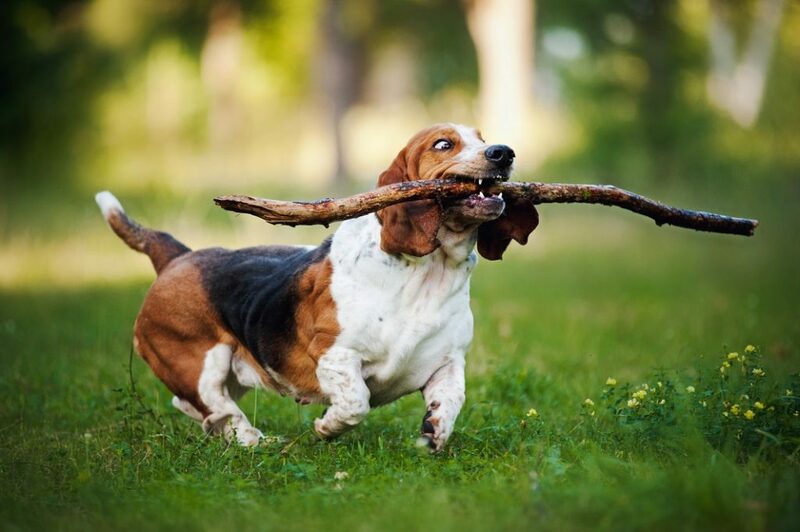 Take advantage of naptime to take a stroll or play a quick game of fetch with your older dog. It’s important to actively work to strengthen your bond with your dog during this time. My dog is a working breed. This means that I have to give him a job to do so that he feels like an important member of the household and doesn’t get bored. Sometimes the job is simply “Keep the floor free of food bits while I cook.” We both benefit from him doing this job. Make sure that your older dog feels extra loved and spoiled during this transitional time. 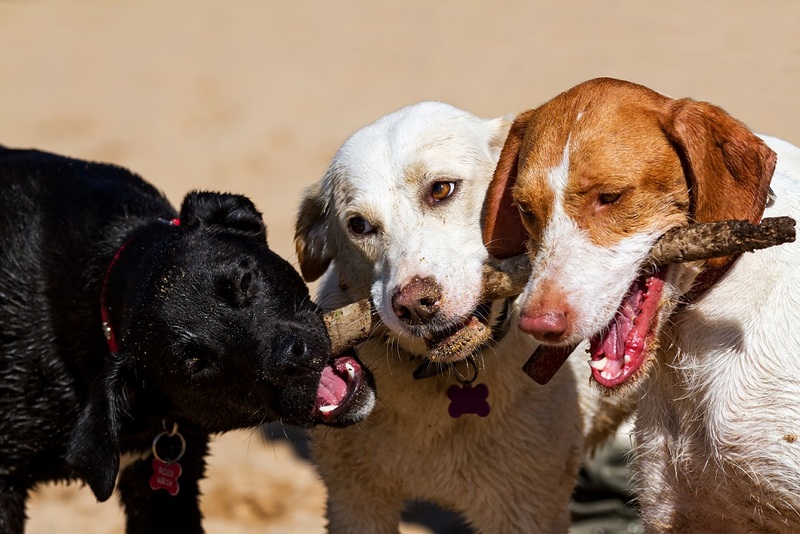 Neglecting your dog for the puppy can cause resentment, which will make it difficult for your dogs to bond with each other. 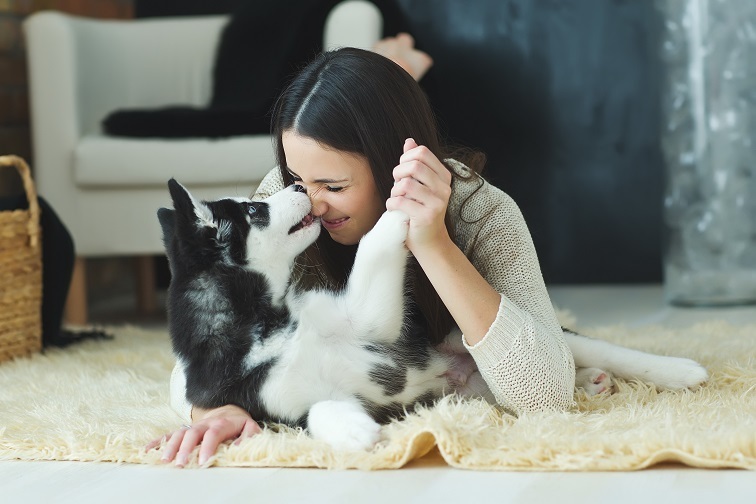 Giving each dog some one on one attention will help alleviate feelings of resentment. When interacting with your dog and puppy together, be sure to make the experience positive by rewarding both dogs with treats and praise. Is your dog is coming up on his senior years? Consider investing in an orthopedic pet bed to minimize pressure on his joints and relieve arthritis pain. 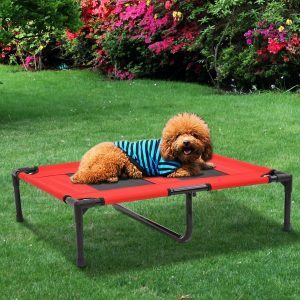 A memory foam dog bed like this one from PawHut can provide your dog with an ultra comfortable place to nap. Getting good, restful sleep means your dog will feel better and have more energy to play with (or at least tolerate) your puppy. Puppies are used to sleeping with their littermates. They can get lonely at night, especially when you first bring them home. A heated pet bed can help your puppy settle down and sleep through the night. 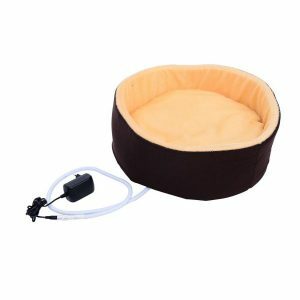 This bed has a soft plush design and the heater pad is removable, so you can easily clean the bed if your puppy has an accident. The smaller size of this bed makes it super cozy for little puppies and fits perfectly inside their crate. If you live in a warmer climate, a raised pet bed can help your dog stay cool. 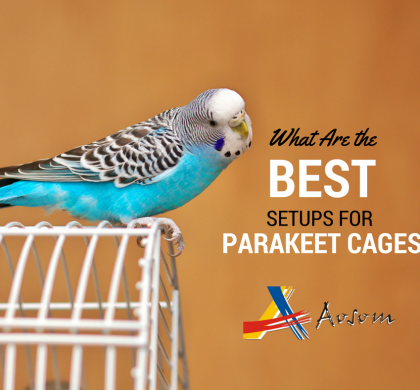 Air circulates under the bed, keeping it cool, and the hammock-like fabric design can relieve pressure on joints. 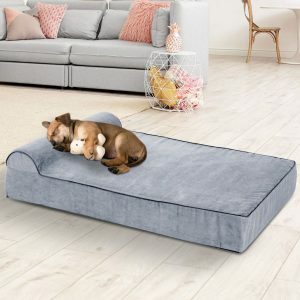 My dogs use this type of bed as a launch pad/ trampoline when zooming around the house chasing each other, which is an unexpected bonus feature. Pet stairs and ramps can be great tools for both older dogs and puppies. 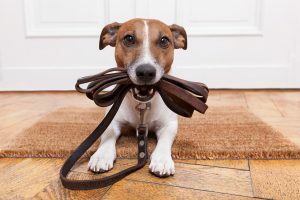 Whether your dog has limited mobility because of joint pain or arthritis, or just because she has tiny little legs, these mobility aids can be super helpful in getting your dogs where they need to go. My older dog has no problem jumping into the car for a trip to the beach. Leaving the beach is another story, however. Once he’s worn out from trotting up and down the Oregon Coast for several hours, getting back into the car is a struggle. Tired of lifting my wet, sandy dog into the car, I bought a ramp so he can walk himself up. This ramp from PawHut folds up for convenient compact storage in the car. The ramp was great for the puppy, too, when she was too little to jump up into the car. If your older dog is having mobility issues and can’t move around like he used to, invest in pet stairs for your home. These pet stairs from PawHut double as storage, and the thick carpeting makes them easy for little paws to climb. 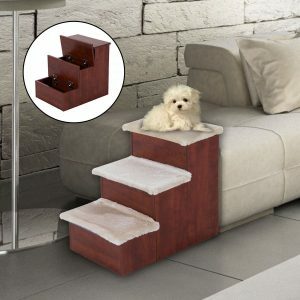 Pet stairs make it easy for your dog to get to his favorite spot on the couch or on the bed. Feeding time can be a challenge with two dogs. Even when you give them the exact same thing, they always think that the other one is getting something better or more interesting. 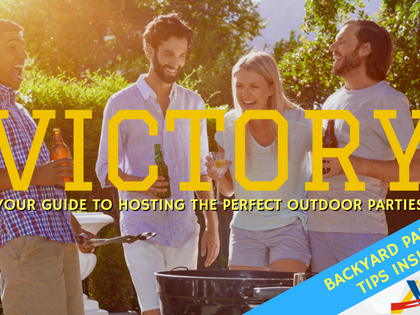 To avoid conflict, make sure they have their own individual space to eat. 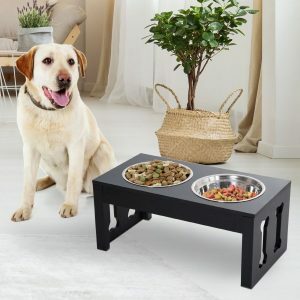 Raised pet food bowls give them a designated place to eat and keeps them out of each other’s personal space. I recommend getting one set per dog so that they each have their own food and water bowls. I don’t mind them drinking each other’s water but always feed them in their own bowls. Eating from elevated food bowls helps to aid in digestion and reduces neck strain. Using a raised dish and a designated eating place will help your puppy establish good habits and dinner time manners. Puppies are really, really good at getting into trouble. No matter how well you puppy- proof your house, they’ll still find something to destroy. For example, my shoes might be safe, but all of my furniture now has teeth marks in it. The best solution is to crate train your puppy! My puppy loves her crate. She puts herself to bed in it every night when she gets tired. The crate should be a safe, secure place for your puppy to sleep and hang out while you’re not home. Never use the crate as a punishment, but rather present it as a special, safe place for her to sleep. To encourage her to see it as a positive place to be, give her treats and extra good chews to enjoy while she’s in it. You can also place an article of your clothing in the crate with her. 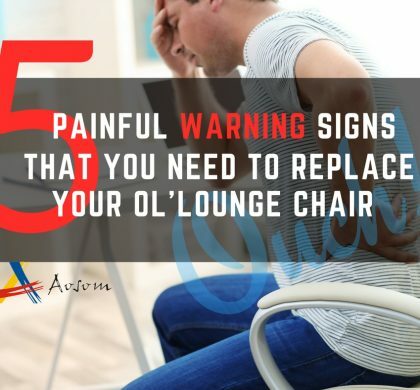 Accidents are bound to happen, though, so make sure it’s one that you no longer want. Using a crate keeps your puppy out of trouble and gives your older dog a break, too. 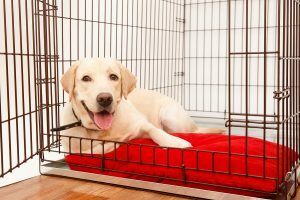 We carry a variety of sizes of dog crates to choose from. Get a crate that will be big enough for your dog once she is full grown. 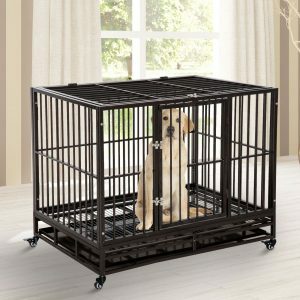 If your older dog is crate trained, great! His crate can be a safe space to get away from the puppy. We stopped using the crate for my older dog when he was about a year old. In retrospect, I think that this was a mistake. 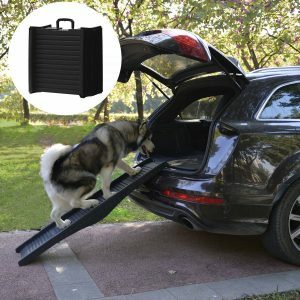 The crate is a great tool to keep your dog secure when traveling or having people come to your home. Sometimes, your dogs are going to annoy each other. I use a pet gate to separate my dogs and give them a break from each other. Don’t feel guilty for doing this. 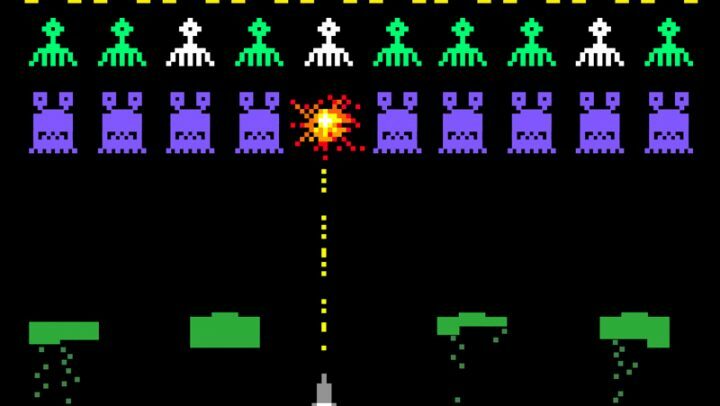 It’s better to separate them and enforce their personal space than to let them push each other into snapping. Being separated doesn’t have to be a punishment; I use the gate to corral them into separate rooms and stuff their Kong toys with peanut butter to keep them distracted. My older dog is a grumpy old man and can only take so much of the puppy jumping on his face and biting his tail. Taking a break from each other while enjoying a special treat helps him recharge for another round of puppy play. A great way to reinforce your bond with your older dog is by doing some training activities. You actually can teach an old dog new tricks! If your dog has joint or mobility issues, a low impact activity is great. 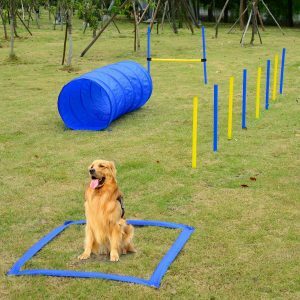 This agility set is versatile enough to be a great choice for any dog, regardless of size, age, or ability. Training sessions give you some one on one time with your dog and help build his confidence. You can also use the agility set with your puppy to help build a strong bond with her. 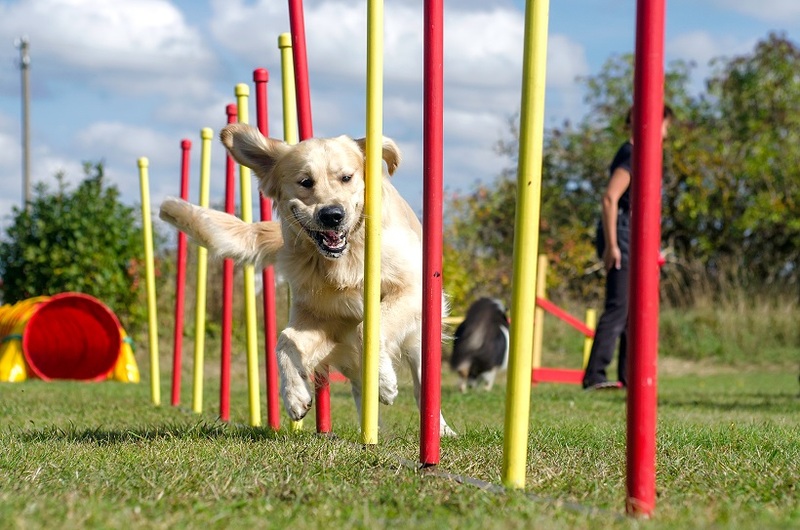 Training is crucial to having a well trained, well socialized dog. I use an agility set as a supplement to puppy classes to help her burn some energy and practice listening to commands at home. Don’t forget the most basic of dog exercise activities- the walk! Walking around your neighborhood or local park is a great way to exercise your dogs and yourself. Living in a super pet friendly city like Portland gives me lots of options for walking my dogs. Depending on your goals, you may choose to walk your dogs separately or together. I recommend walking them separately, because it allows you to bond with your dogs individually. It also lets you work with your puppy one on one to learn good leash manners. Walking them together can help them bond with each other by giving them a common purpose or goal, although their common goal often seems to be to pull me into traffic or into the creek. Bringing home a new puppy can be stressful. No matter how cute and cuddly your little ball of fluff is, you’re bound to get tired and frustrated sometimes. Don’t forget to take time for yourself. Being a patient dog parent is hard when you’re exhausted. Recently, I started taking my puppy to doggy daycare two or three days a week. This has been a life saver. I drop her off in the morning, and she spends the whole day playing and socializing with other dogs and the staff. When I pick her up she is calm and sleepy. I get to spend the evening having quality time with my older dog and quiet time to myself. Once your puppy has all of her vaccinations, sign her up for a doggy daycare. The daycare will help her learn to socialize with other dogs and expend a lot of excess energy. This will give your older dog a break from her, and give you some free time while she sleeps it off. A great way to keep your puppy entertained and your older dog happy is to supply them with some delicious natural chews. Right now, my dogs are obsessed with pig and cow hooves from our local pet supply store. 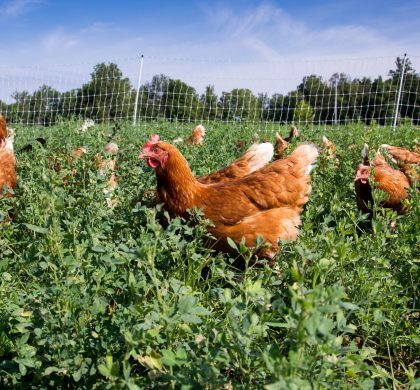 Sure, they smell terrible, but it keeps the dogs happy and busy. Natural chews such as hooves, bones, horns, and antlers promote good dental hygiene and will keep your dogs entertained for hours. 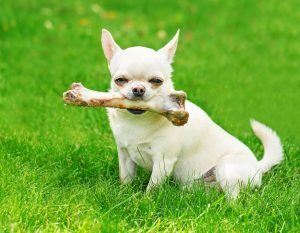 Never give your dogs cooked bones from your kitchen, as they can easily splinter and cause dangerous intestinal issues. Pet supply stores carry pork and beef bones that have been specially treated to avoid this and are much safer to give to your pets. I also avoid rawhide chews as they can cause intestinal blockages. 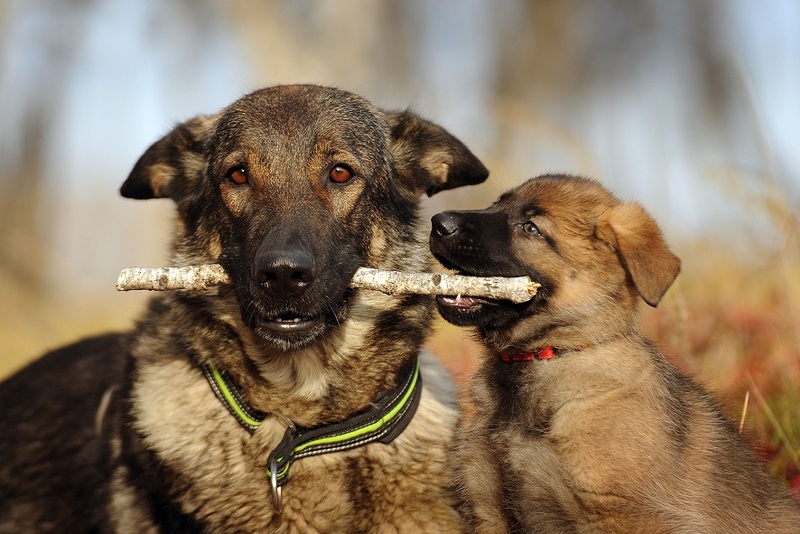 Don’t be afraid to give your dogs treats to encourage good behavior. Both of my dogs are highly food motivated, so I bribe them with food constantly. Teaching a new trick? Give treats. Going for a walk? Give some more treats. Putting your puppy in her crate? Shower her in treats. 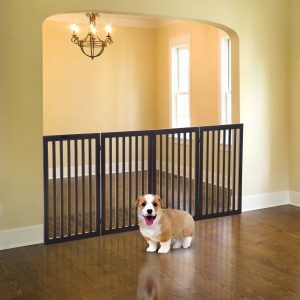 Using the gate to confine your older dog to the kitchen? 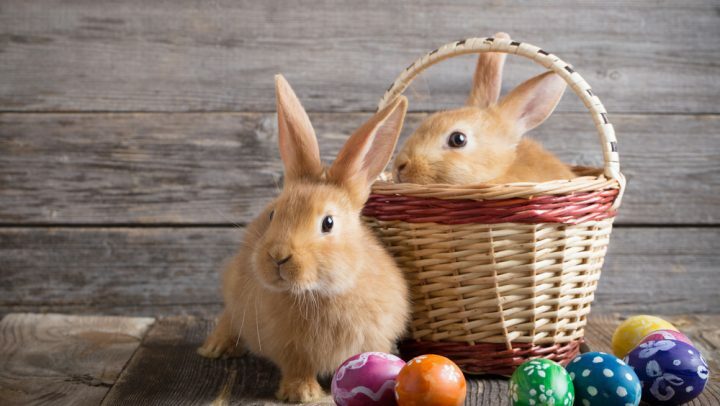 You guessed it, treats! I find that it’s most cost effective to buy treats from the bulk section at my local pet supply store rather than buying pre-packaged treats. You can also experiment with dog friendly foods you probably have in your kitchen, such as apples and carrots. Always do a quick Google search before giving your dog something new. Foods such as grapes and onions might be great for humans, but are dangerous for dogs. My dogs go crazy for sweet potatoes, cucumbers, and cheese, so experiment and find out your dog’s favorite food! Teething, potty training, and general insanity: I promise it will end. Play biting starts to taper off significantly around 5 months. Destructive chewing will probably stop within a few more months. Once your puppy loses her little needlepoint puppy teeth and starts growing those big girl teeth, if you have been consistent about correcting play biting, it will almost magically end. My puppy just lost her last baby tooth, and I’ve already noticed much less chomping. Potty training is hard. Some dogs pick it up quickly, some do not. It’s normal to feel hopeless and like your puppy will never learn to go outside, but don’t give up. My older dog was potty trained at 10 weeks. My puppy wasn’t potty trained until 16 weeks. Don’t lose hope! 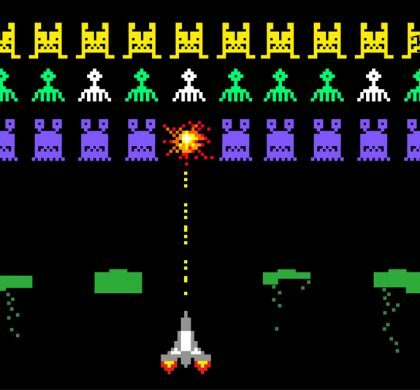 It will happen. Be consistent. For extra help, I use forums like Reddit to get dog training advice and support. Dogs are a lot of work, but it’s worth it when you come home to happy faces and wagging tails. 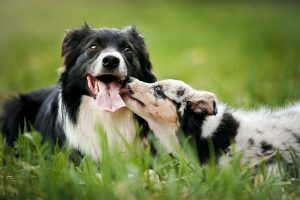 If your dogs aren’t best friends yet, keep being patient and positive, and utilize some of the strategies in this article. 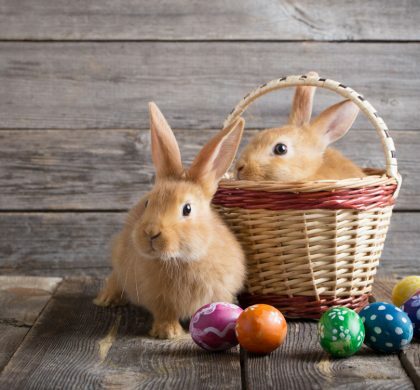 With a little luck, your furry friends will be besties in no time!